Garrett ACE 250 Metal Detector Review - The Best Entry-Level Model? The ACE 250 is a lightweight beginner's detector with notch discrimination, 5 search modes and a host of other features. How does it compare to other entry-level models though? Read my in-depth review to find out! 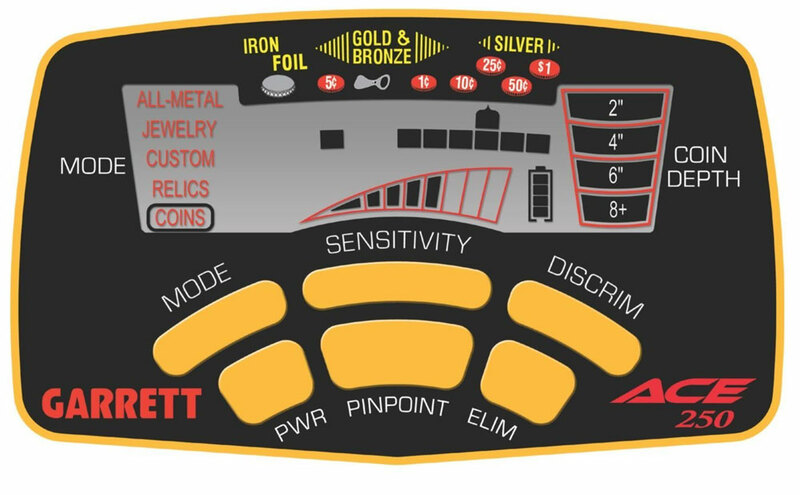 The Garrett ACE 250 is a wildly popular detector from one of the industry's biggest brands. It’s a lightweight model aimed at beginners, but is packed with features usually found on pricier detectors. As the numbering system suggests, the ACE 250 sits around the middle of Garrett’s popular ACE range. It aims to provide more features than the 150, while being cheaper than the 350, so it’s theoretically a balanced choice for beginners (click here for other starter detectors). Does the ACE 250 live up to its reputation as an excellent entry-level detector though? And how does it compare to other models? Keep reading my Garrett ACE 250 review to find out. Where Can You Find the ACE 250 On Sale? Let’s start with the basic specification. The ACE 250 is an entry-level VLF detector with a 6.5kHz operating frequency. This frequency is great for coin hunting and acceptable for relic or jewelry hunting, but is marginally lower than the 350 so provides less sensitivity. It’s also too low for gold prospecting – but this is to be expected, as the ACE series isn’t designed to handle soil with high levels of mineralization. Garrett are known for producing high-quality detectors that are intuitive to use. The ACE 250 is a great example, as it’s designed to be simple without sacrificing features. At just 2.7lbs, the ACE 250 is a lightweight detector that’s extremely comfortable to use. It’s built with a three-piece design, along with an elbow rest for greater comfort. Unlike some detectors, the controls are all easy to reach and the panel doesn’t feel “fiddly” to use in the field (more on that in the moment). The stem is adjustable, so the total length can range between 42”-51”. The detector runs on four AA batteries, so to save money you might want to buy rechargeable cells – although this may slightly reduce the run-time. With new batteries, you can expect to get around 20-25 hours of run-time. The only criticism I have about the design is that the Garrett looks a bit cheap. This isn’t a big problem, and it almost seems unfair to bring it up considering the low price, but the ACE range’s yellow and black color scheme isn’t to everyone’s tastes. It’s also worth noting that there is no volume control. If you want to use headphones (which you should), then make sure you buy some with built-in volume control. 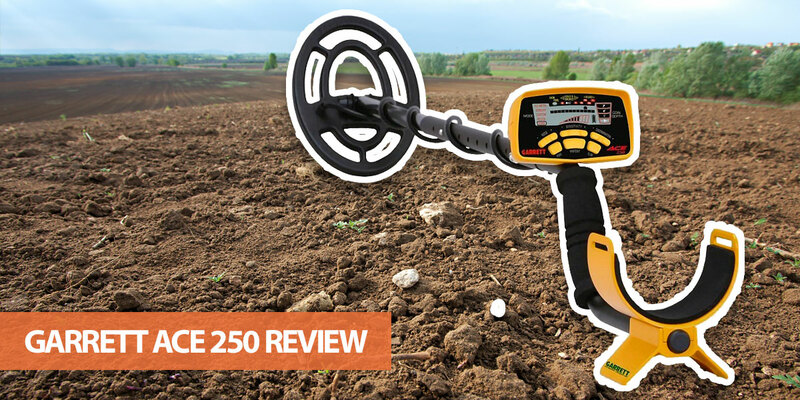 Even so, if you’re looking for an ergonomic detector you can use all day without getting tired, then the 250 is one of the best in its price range. It's surprising how many features Garrett has managed to include in such an inexpensive package. With an LCD screen, five search modes, Accept/Reject discrimination, depth indicator and a pinpointing function, the 250 has features you wouldn't expect on a model at this price. The ACE 250 doesn’t include numerical Target ID, but there is a graphical target display with 12 segments. This is accompanied by a simple legend that tells you whether the object is likely to be iron, gold, bronze or silver, along with an indicator of object size. While this type of Target ID isn’t as precise as a numerical system, it’s great for getting a quick idea of what you’ve found before digging a plug. The large labels also make it much easier to use for beginners than a 0-99 numerical ID. There are also three audio tone levels. Once you’ve learned the various tones, you won’t need to continuously watch the control panel. Iron, for example, has a lower tone than other metals, so this is another way for you to discriminate trash objects from real targets when using all-metal mode. Nearly all “real” metal detectors include a discrimination setting, and the ACE 250 is no different. The 12 Target ID segments I mentioned earlier are used to create notch discrimination, so you can filter objects depending on the environment. This gives fine control over which items are ignored or signalled. While discrimination is a standard feature, the 250 does a good job of ignoring objects you don’t want to find. It’s also easy to adjust using the plus or minus buttons. Be aware that eliminating trash signals may accidentally cause the detector to ignore real targets though. Five search modes are included with the ACE 250. These are pre-set discrimination patterns – although you can adjust the settings of each. All-Metal – This mode detects every type of metal and ignores any discrimination setting. If you’re not sure what material you’re looking for, or just want to dig everything to avoid missing a real target, All-Metal is the right choice. You can also switch to this mode when you’re getting an inconsistent signal to check if a target is being covered by a nearby trash item. Jewelry – Jewelry mode is designed to find items such as watches, bracelets, rings and necklaces. The discrimination pattern tries to ignore trash, including nails and bottle caps, by getting rid of the two leftmost iron discrimination segments. Coins – Like the Jewelry mode, the Coins mode aims to ignore iron trash, pulltabs and other objects that are often found when coin hunting. It’s great for hunting in parks where there is too much trash to dig everything. Relics – This mode aims to ignore small iron items while retaining brass and lead objects. Custom - When you want to create your own discrimination patterns, the custom mode allows you to save your settings. Beginners may not use this feature too often, but it’s great to have the option as your skills improve. Along with these search modes, there’s also a pinpointer function for getting a more accurate target location. I usually prefer a dedicated pinpointer - but having this feature built-in is always useful. Garrett has also made the pinpointer easy to use. Once activated, you just need to listen for the strongest signal to know when the center of the coil is directly over a target. The top cursors also indicate the signal strength, which is a useful visual aid when trying to find your target. The basic ACE 250 package comes with a 6.5” x 9” PROformance searchcoil. This is an elliptical coil that provides a more focused detection pattern than circular alternatives, but without the even depth or separation of a DD coil. It’s also submersible – although be careful when using it near water as the control box isn’t waterproof. This is a good time to mention that the upgraded ACE 350 does come with a DD coil as standard. You’ll need to pay around $100 more, but you get the upgraded coil along with a higher operating frequency. Even so, the ACE 250’s standard searchcoil provides perfectly acceptable performance. If you want enhanced separation or more even depth, however, there’s the option of buying a DD searchcoil for the ACE 250. 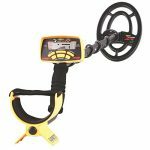 The Garrett ACE 250 metal detector comes with an excellent screen – especially considering the low price. It provides a reasonably large viewing panel along with high contrast cursors so it’s easy to see. Mode – This button cycles through the preset modes. Once a mode is selected, you can manually adjust the settings, but these changes won’t be saved when you turn off the machine. Sensitivity – The sensitivity of the detector ranges between 1 and 8 “bars.” The higher the sensitivity the deeper the detector can see, but if you have it too high you’ll be overwhelmed with false signals. Fortunately, the ACE 250 provides surprisingly good depth even when on a lower sensitivity setting. Discrimination – I’ve already mentioned the discrimination setting, but it’s worth repeating how easy it is to use. To change which segments are ignored, you use the DISCRIM button to select a target ID and the ELIM button to toggle it on or off. This makes it simple to create a custom discrimination pattern depending on the environment. Pinpoint – To use the pinpoint function, this button needs to be held while you narrow down the search area. Aside from these controls, the display also has a simple coin depth indicator and a battery level icon. The depth indicator is useful if you regularly hunt coins, as it provides depth down to 8”. To summarize this section, the ACE 250’s control panel is one of its best features. The screen makes it easy to see your current settings and target IDs. Everything is clearly labeled, so a quick glance is often all you need, and the buttons aren’t fiddly to use. The ACE 250 comes with four AA batteries, a manual and an elliptical coil – but there isn’t much else in the box. For this reason, you’ll need to factor in the cost of buying a coil cover and headphones into the total cost of the machine. There are different packs available with various accessories though (some include headphones), so make sure you know which pack you're buying. The Garrett ACE 250 provides great value for money. It’s a relatively cheap detector, but has features that would normally only be found on more expensive models. The visual Target ID, depth indicator and notch discrimination settings, in particular, are often not found on the cheapest detectors. In other words, this blows away any of the “toy” detectors you might see in stores. It’s also a great option for people who want to try metal detecting without paying $600+ for a mid-range detector. There are very few beginner metal detectors that can match the Garrett ACE 250 when it comes to treasure hunting. Aside from the model’s range of features, it’s also highly sensitive and easy to use. Of course, that doesn’t mean it’s better than higher priced models. But it provides brilliant performance for the price and makes some advanced features attainable for people on a tight budget. There are some drawbacks to the ACE 250. The ground balance is factory preset, so it can’t be adjusted by the user to account for mineralization. This isn’t an issue for beginners – and may actually be a good thing as it’s one less setting to worry about. Experienced detectorist will feel limited in tough conditions though – and it will struggle in ground with heavy mineralization. While you can use the sensitivity setting to reduce false positives, this won’t help in the toughest environments. For everyday detecting in ground with mild mineralization, however, the ACE 250 provides great performance. The sensitivity is excellent, so in the right conditions it’ll pick out small pieces of metal you might expect an entry-level model to miss. The sensitivity also provides respectable depth. You can expect to find coins down to a depth of around 6” – and in some cases even deeper. This depth doesn’t match some of the higher-end coin detectors, but it’s not bad. Note: An easy way to select the correct sensitivity is to increase it until you start getting chatter. You can then dial it back a segment or two to avoid too many false signals. The ACE 250 is around $60 more expensive than the 150 – but comes with several additional features. While the screens look similar, the 250 has many more settings and adjustment options. One of the biggest omissions from the 150 is that you can’t manually adjust the discrimination pattern. That’s not all you’re missing out on if you choose the 150 though. There are only three modes included with the ACE 150 – All-Metal, Jewelry and Coins – and there’s no pinpointer function. There are also fewer segments for sensitivity and discrimination, so you have less control over how the detector performs. For these reasons, I highly recommend choosing the 250 over the 150. It’s only marginally more expensive but is a far more well-rounded detector. The ACE 300 is a newer model that slots between the 250 and 350. It’s around $50 more expensive, but includes extra features and settings. Some examples include Digital Target ID (0-99), four iron segments compared to two on the 250, 8kHz operating frequency and a larger concentric coil. While these features can be useful, and the 300 is a clear upgrade to the 250, they don’t represent a huge step up in performance. The right option for you depends on your budget. Note: Can your budget stretch further than the 300? If so, check out my Garrett ACE 400 review. The Fisher F22 and ACE 250 are excellent entry-level detectors. Both come with a range of features, including notch discrimination, pinpointer mode, iron audio and a graphical display. They also provide excellent detection sensitivity. If I had to pick one, the Fisher F22 is my #1 entry-level detector though (see my list of the best detectors for more information). It has a rapid recovery time, so it’s fantastic at discovering targets that would otherwise be hidden by trash. It can also search a few inches deeper than the Garrett and has a full 1-99 Target-ID system. With that said, I don’t think you’ll be disappointed with either detector. The Garrett ACE 250 has been around for a while, so it’s available via a number of online and offline stores. Examples include Amazon and Walmart. You can also find it at most specialist metal detecting stores, such as Kellyco. There's also the option of buying a used or second-hand model. As it's such a popular detector, it can be relatively easy to find on sites like Craigslist or Ebay. The Garrett ACE 250 metal detector is one of the best-selling detectors of all time – and it’s easy to see why. This is a fantastic entry-level detector for beginners. It even has enough features to be used as a backup by more experienced detectorists. Some of the best features of the ACE 250 are its easy-to-use control panel, notch discrimination and target depth indicator. It’s also highly sensitive in the field – especially compared to most models in this price range. There are a few drawbacks though, which is why it’s narrowly beaten by the Fisher F22 when it comes to an entry level detector (at least in my eyes). It doesn’t provide the same search depth as the Fisher F22 – although it still manages a respectable 6”-7” for larger coins. The lack of volume control is a minor annoyance unless you have headphones with volume settings. It also lacks manual ground balance adjustment, although this is to be expected from a detector in this price range. Despite these minor issues, the Garrett ACE 250 is a brilliant machine that I highly recommend for beginners. If you like the Garrett brand and want an easy-to-use first detector, this is the one to get. I hope this Garrett ACE 250 review has helped you decide whether it's the right detector for your needs. If you have any questions, please use the comments form below.